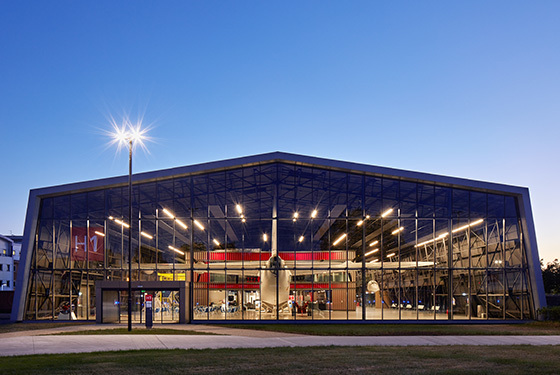 On the day of the Royal Airforce centenary celebrations, AA Members and alumni are invited to join this exclusive tour of the new Royal Airforce Museum in north London, led by alumnus and former tutor Alan Dempsey (AADRL 2002), founding director of architecture practice Nex, who has recently completed a large-scale redevelopment programme of the museum. The multi-million-pound project is the realisation of a masterplan by Agence Ter and Nex, and the result of an international competition win in 2014. The scheme sees the creation of new exhibition and visitor facilities alongside new landscaping that improves visitors’ understanding of the site and the museum’s connections with surrounding communities. The tour will start at 3.30pm but Members are welcome to arrive early for the centenary flypast at 1.05pm. Places for the tour are limited – please book below. Posted on July 10, 2018 July 5, 2018 by membership	Bookmark the permalink.